« Service of Leaving Well Enough Alone: Why Change a Good Name? This entry was posted on Monday, October 15th, 2018 at 10:19 am	and is filed under Business Decisions, Employees, Empowerment, Fashion	. You can follow any responses to this entry through the RSS 2.0 feed. You can leave a response, or trackback from your own site. I agree–in fact, refreshing for any industry. Personality matters though. If an employee must be prodded to get work done or for every task must be taken by the hand, step-by-step, then this wouldn’t be the environment for them. I’m afraid I’m not much on fashion. What I like best to wear was what I wore sixty years ago, but it sure does sound like Ms. Fisher is one great lady to work with and for. I wish there were more like her around to lead us in these increasing difficult times. More power to her! Just writing about her business approach makes me feel calm. As for your style, no doubt whatever it was 60 years ago is back–and has been a few times–so you’re in luck! 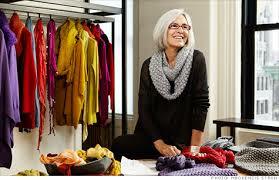 I can’t help but admire Eileen Fisher for the same reasons you note. Her style was meant to be and continues to prove itself timeless. She enables women of all ages and an enormous variety of sizes and shapes to dress attractively and elegantly. The quality of her clothes is impressive. She makes looking well-groomed relatively free of angst. Her philosophy of marketing with a diversity of models and her very intelligent non-hierarchical approach obviously work. She is a splendid contradiction to the the wildly negative fashion terrorist as either boss or designer. It is so refreshing, especially in this terribly unpleasant moment in our society, to read about doing good having good results.